Following on from my article about choosing a cornet mouthpiece which includes a discussion of balancing out the resistance I thought I would share my knowledge of cornet mouthpiece throat sizes. I have converted the sizes to US drill sizes for easier comparison. For a description of what these sizes mean see Jim Donaldson's very informative article here. Throat size is one element in determining the resistance of the system (the others being instrument bore size, mouthpiece gap and embouchure aperture). Its possible to compensate against a very resistive instrument by using a mouthpiece with a larger throat (bore) size or against a very open instrument by using a tighter mouthpiece. 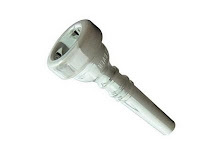 Bach used to (maybe still) do custom mouthpiece work and I have seen a 5V (very deep V cup) with a larger #20 throat that was stamped "20" in the factory. Schilke now make deep V shaped "symphony" models. I do not know what throat sizes these use. These mouthpieces were originally designed for the old Imperial and early Sovereign cornets which had more resistance than current models. I feel that they tend to encourage over blowing in modern, freer blowing, instruments. Wick seem to have recognise this issue by making a 4 ½ which is identical to the 4 but with a narrower #16 throat. The shape of the cup of a mouthpiece also affects resistance with flatter, shallower cups generally being more resistive. You can test the relative resistances of two mouthpieces by running a constant stream of water into them from a tap and observing how much it will take before the cup starts to overflow. Its surprising how much some apparently small mouthpieces will take (try comparing a smaller Jet-Tone trumpet mouthpiece with a standard Bach 7c - the apparently small Jet-Tone will handle as much flow). Grease a 1 lb loaf tin. Sieve flour into a mixing bowl. Add baking powder and stir in well. Add sugar and stir in. Drain raisins through the sieve and stir into mixture. Whisk the egg in a bowl with the milk. Add the egg and milk to the mixture and mix till even. Cook for 90 minutes at 170 degrees (150 degrees for fan assisted ovens). 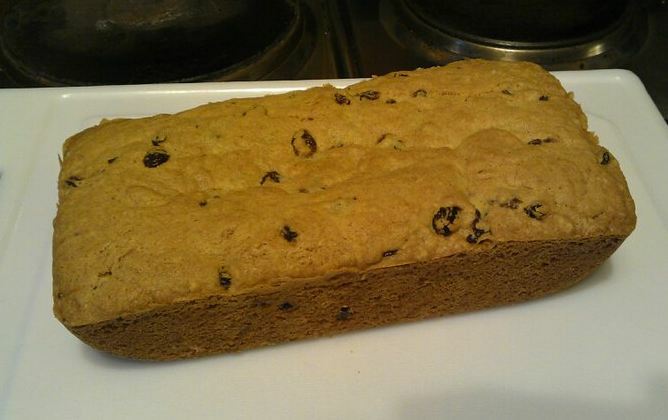 Leave to cool before tapping out of the tin. Store Cake in a airtight container when cold. Having wrongly predicted the end of the world for the second time Harold Camping may seem the ultimate figure of fun. In fact I have a feeling that his name might well enter the vocabulary in the way that the mythical Ned Ludd gave his name to the luddites. Mr Camping may be seriously misguided, a fraudster or a liar. You can take your pick, but he has made people think about the moment rather than the future or the past. For about 48 hours we all thought about where we are now rather than where we might be tomorrow. I went out clothes shopping with my daughter yesterday and we had a very good time enjoying the small things that life brings. Maybe this is the lesson we can all learn from 21st May 2011. Enjoy life for what it is and while you can. 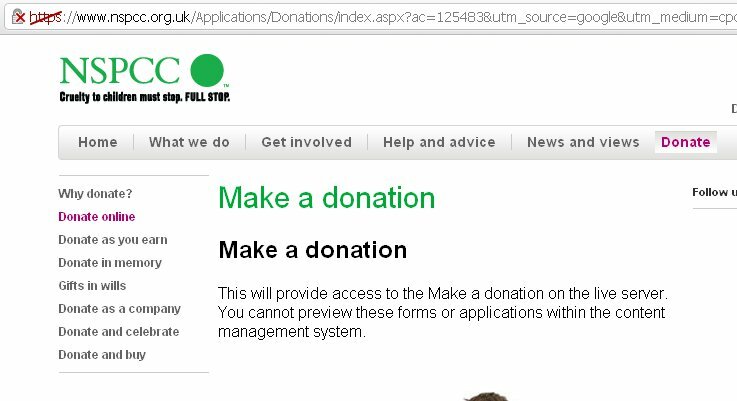 Having spent part of today sorting out a charity's online donation page I was keen to have a look at what other charities' forms looked like and how they handled the process. I was surprised to see that Cancer Research UK had a certificate error caused by them using two canonical names with one certificate - this would work with a wildcard certificate, but not the one they have. 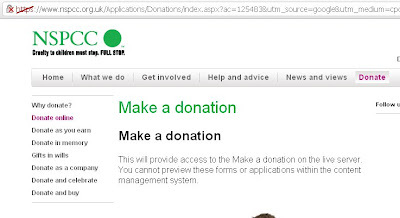 Then I searched for the NSPCC online donation page through Google and came to this page which has a message from their web developer about their CMS and an SSL error - in this case some insecure content on a secure page. None of this looks good, especially given the resources these organisations have. Its nowhere near good practice. Interestingly I then searched for Barnardos Scotland on Google which displayed a link that was a 404 error, although manually typing the displayed address in worked. Thats a Google fault rather than a barnardos one though. All very interesting, and I suspect the result of insufficient ongoing testing of their web site processes. I know from my time in the web hosting and domain registration industry that we had to regularly test our order processing systems to make sure they were behaving as expected.